叉烧包 - pronouns as "Char Siu Bao" in cantonese means BBQ Pork Bun. 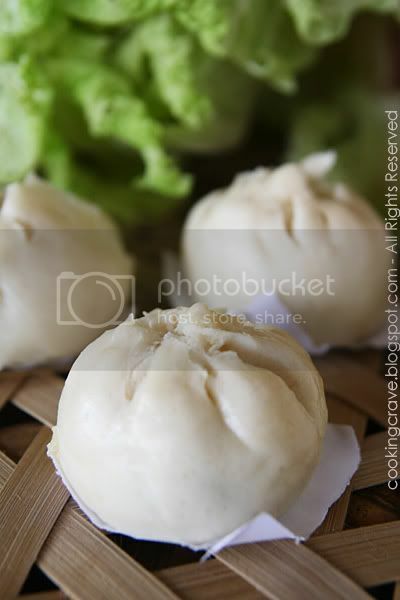 There are variety types of Char Siu Bao out there - steamed, baked or fried Char Siu Bao. For me, I prefer the mini steamed one and those which "smile"/cracked on top of the baos. 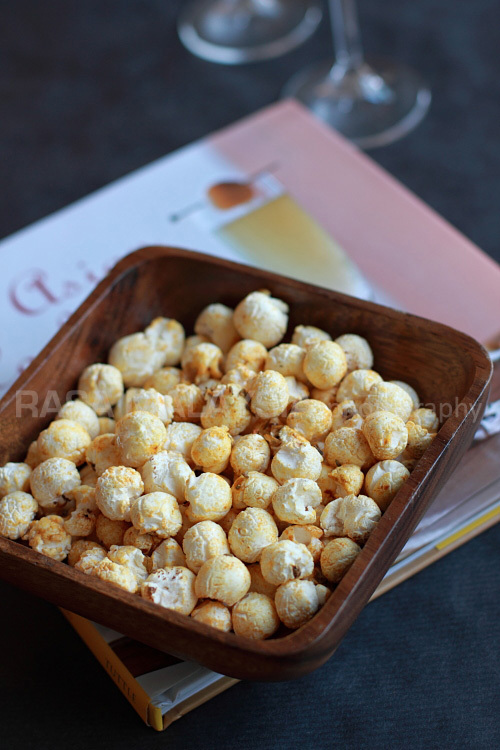 I've read several recipes online and I found some of them are very time consuming. We have to let the dough proof overnight about 8-10hrs and very complicated ingredients using shortening, ammonia and vinegar. As a beginner in 包's making, I don't have a bread maker/stand mixer and I have to hand knead the dough. 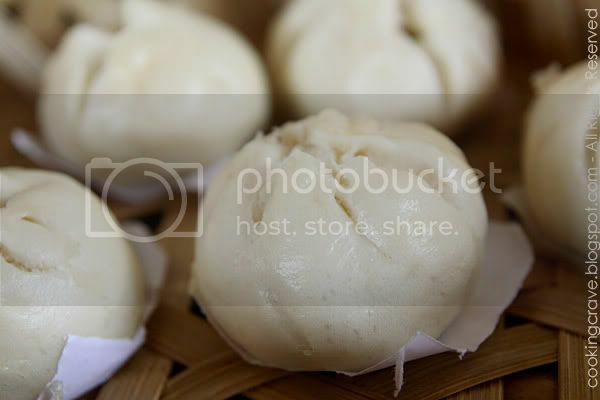 I just try out this simple recipe of 叉烧包/Char Siu Bao shared by my close friend Wendy. On my first time making this baos, everything turn out right. 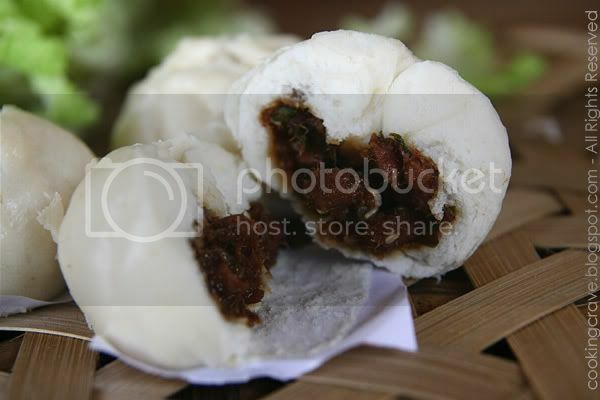 The baos are soft, fluffy and cracked like it has to be but there are tiny brown spots all over it. I try to figure out what happen to the tiny spots. I can't get the answer online as Wendy are not online at the time and I try to search and read others blog but still couldn't got the answer. Since I still have some "char siu" fillings left, straight I make the second batch of this little baos. The result is still the same, everything are okay except the brown spots again. What I did to cause the brown spots??? Although there are brown spots on my baos, but the baos are all finished up by my kids and I give some to my parents too~lol... It's really yummy!! I leave message for Wendy, telling her my problems. She figure out that, maybe I didn't knead and mix the baking powder mixture correctly. It's cause by the uneven dough. Arhh..maybe she is correct~lol.. I try making it again yesterday night. This time round, I put more time to knead the dough. Pour in the baking powder mixture slowly, bits by bits knead the dough till it's really mix thoroughly and soft. Oh my, finally I got the WHITE baos smiling at me~ yeah!!! Although it turn out much more better than my previous one but I still not very happy with the result of my baos. My baos still splits but not as pretty as Wendy's. Need more practice as practice makes perfect~haha!! I found it really hard when fold and sealing the baos after we spoon in the ingredients, really need more practice on that. Mix yeast in warm water. Sieve cake flour and wheat starch together. Slowly add in the yeast water into ingredient (B) and knead to mix well, this will take about 20mins. After 90 minutes, mix the dough with baking powder mix in 10g water. Slowly pour the baking powder mixture into the rested dough and knead the dough to mix well. Rest for another 20 minutes. Divide the dough into 25g balls (for petite size bun). Dust your working surface, hands and rolling pin with some flour. Roll the ball to a 1.5" diameter skin (the middle should be thinner than the edge). Spoon the BBQ pork mixture in the middle of the skin, fold and seal with your fingers. Do not let the fillings touch on the edge as this will make your buns not cracked/smiled. Steam at high heat for 10 minutes (petite size), 12~15 minutes for bigger size baos. In a bowl, add in all ingredients and mix well. Warm the non-stick pan and stir in the fillings until it's a bit sticky. Stir in the roasted sesame and green onion. 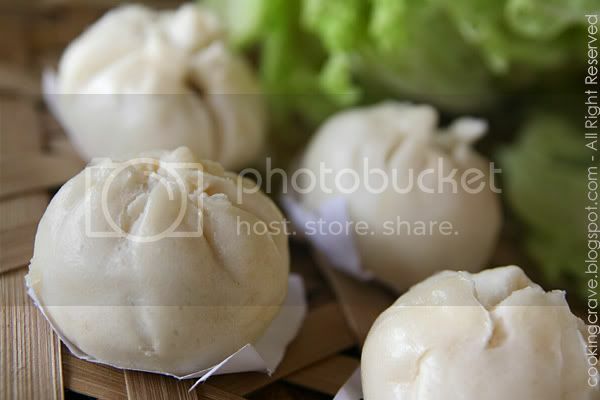 Click HERE for more 叉烧包/Char Siu Bao's and the filling's recipe at My Home Kitchen. hahaha.... finally no brown spot liao!! The bao is nice...hungry liao. tin tin... i know why you didn't get BIGGER Smile. When you seal the Bao, leave more flour on top of it, that will give more flour for bigger smile. Giggle: What flour do you mean?? I did leave the edges thicker than the middle when I roll it already. Those pork buns look really good! Thanks for sharing this. I tried it out today and also yield a brownish spot on the pau though I tried to knead it longer. Is your baking powder solution in liquid form or paste coz mine was more paste like. do i have to mix the water and yeast let for 10 mins to bubble. then after that then the ingr b.
mine did not rise. please help.